Chayote, which has the scientific name Sechium edule, is a pear-shaped light green vegetable that belongs to the Cucurbitaceae (gourd) family, along with other members that include cucumber, pumpkin, melon, and squash. Chayotes are well-recognized field plants in the Midwest and some southern states such as California, Florida, and Louisiana. They are also called mirliton, christophine, chocho, sayote, and vegetable pear. Chayote is a perennial vine that needs moist soil and long and warm seasons to be able to grow properly. This means that when you are located in a cold area, you should opt to plant chayote during the summer and make it an annual crop. In more temperate or tropical climates, chayote can be grown the whole year round. Chayote crawls on shrubs, fences, and even trees, but in a cultured environment, chayote holds on to strong trellises. It can grow up to 12 meters in height in such an environment. It is advisable to plant chayote seedlings side by side so as to encourage cross pollination and thereby gain more crop yield. Chayote can be ready for harvest after 30 days of pollination, with each plant giving as much as 150 fruits in a season. Take time to note how much the fruit has grown; if it is already four to six inches in diameter, it is time for harvest. It is also ideal to harvest chayote before its flesh gets hard. Chayote’s fruit has pale, green skin and has 10 to 20 centimeter vertical furrows or wrinkles running over its surface. The fruit’s flesh has a central cream-white seed-ovule, which has a nutty flavor. Some variants of chayote bear thorny fruits. Chayote tastes like butternut squash or pumpkin with its crunchy texture – akin to the texture of cucumber and potato – and mildly sweet to bland tang. It was first discovered back in the 1700s and was first catalogued in P. Browne’s 1756 book titled The Civil and Natural History of Jamaica. Chayote is a very low-calorie food, as 100 grams of it contain only 16 calories. Aside from that, it contains a lot of dietary fiber, antioxidants, and vitamins and minerals which make it good for cholesterol control and weight reduction. Chayote carries 23 percent of the recommended daily intake (RDI) of folates per 100 g. Folates are important in conducting proper cell division and DNA synthesis. 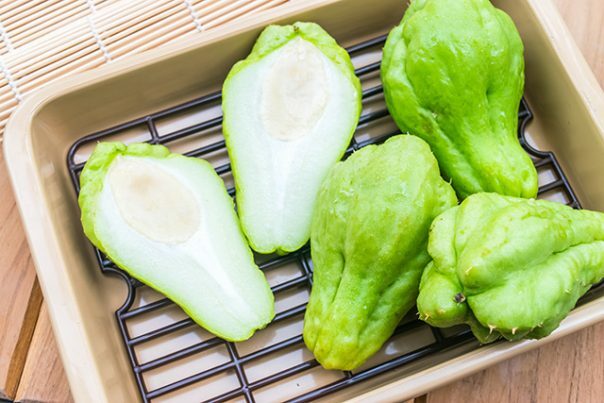 A regular diet of chayote before and during early pregnancy can help prevent the occurrence of neural tube defects in newborn babies. Apigenin and luteolin, which are aglycone flavonid polyphenic antioxidants that are found in chayote, nueutralize harmful oxygen-derived free radicals and reactive oxygen species which cause aging, the influx of diseases, and, worst-case scenario, cancer. The vitamin C in chayote helps fight the onset of common illnesses such as the common cold. It also protects skin (by treating skin deficiencies such as scurvy) and eye health. Chayote is good for the cardiovascular system. It reduces the excess amounts of homocysteine – a chemical compound that is linked with an increased risk of stroke and heart disease – and regulates cholesterol and blood pressure levels. Chayote can be eaten raw, but it is better if you bake, boil, or saute it first. In Asian cuisines, chayote is incorporated in stir fries, curry, soups, and stews for texture and added flavoring. However, in the United States, it is more popular as a dessert, as it is added in pies, breads, cakes, and casseroles. Chayote can be used as a fruit or vegetable salad ingredient. It can also be mixed, along with beet, cabbage, and parsnips, to make coleslaw. Chayote roots can be used as pig or cow fodder. The vitamin C in chayote helps fight the onset of common illnesses such as the common cold. Chayote is good for the cardiovascular system. Chayote is a very low-calorie food, as 100 grams of it contain only 16 calories.